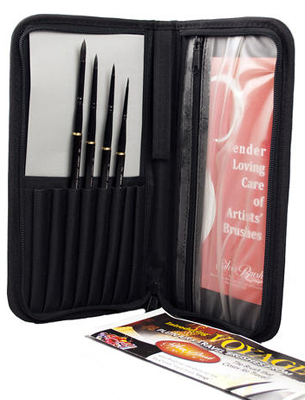 Black Velvet® Voyage™ offer unsurpassed quality and convenience in a watercolor brush. Made of 5 Diamond quality natural squirrel hair and a black synthetic blend, these brushes hold huge amounts of color and release it with perfect control for watercolors, silk painting, inks, dyes, water acrylics and gouche. 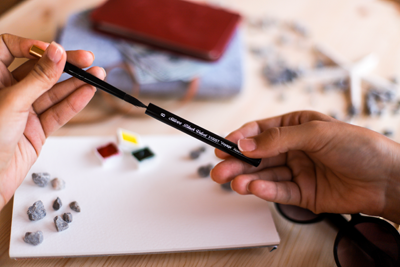 The Voyage™ brushes are specifically design for plein air or travel painting and can easily fit in your pocket. For ease of transportation, the brushes collapse and fit inside the handle for secure storage. To use the brush, simply remove the gold cap, exposing the brush and then insert the gold cap into the black handle.